Difference between revisions of "DVB-S"
DVB stands for Digital Video Broadcast - Satellite. At its core, DVB-S is a simple mechanism. Digital transmitters beam sets of channels to an area, and they are received by antennas aimed at the transmitter. The scope of this article is to provide basic understanding of DVB-S technology, dish pointing and peaking, and setup in MythTV. In keeping with the philosophy of the (largely US based) MythTV development and user community, no discussion of prohibited activities (civil or criminal) is welcome at any time. If some activity utilizing DVB-S is legal in your locale, bear in mind that it is likely *not* so in the United States (under whose laws MythTV must exist) and is therefore *still* unwelcome in all official MythTV support channels. DVB-S and DVB-T (Digital Video Broadcast - Terrestrial) share in common many characteristics. They both share in common a remote transmitter broadcasting a signal through the air to an antenna, with bundles of channels (multiplexes) being transmitted by one or more transponders. In the case of terrestrial broadcasts, the need for precise aiming is less critical as the transmitters are largely omnidirectional and within short distances. In the case of satellite broadcasts, however, the antenna (dish) must be aimed at an object the size of a schoolbus at a distance of 35,000 kilometers. Precise aiming is, to say the least, critically important. DVB stands for Digital Video Broadcast - Satellite. At its core, DVB-S is a simple mechanism. Digital transmitters beam sets of channels to an area, and they are received by antennas aimed at the transmitter. The scope of this article is to provide basic understanding of DVB-S technology, dish pointing and peaking, and setup in MythTV. In keeping with the philosophy of the (largely US based) MythTV development and user community, no discussion of prohibited activities (civil or criminal) is welcome at any time. If some activity utilizing DVB-S is legal in your locale, bear in mind that it is likely '''not''' so in the United States (under whose laws MythTV must exist) and is therefore '''still''' unwelcome in all official MythTV support channels. DVB-S satellites are in geosynchronous equatorial orbit. This means that they are in fixed orbital locations over a single spot on the equator. In populated portions of the world, there is a broadcast satellite at approximately every three orbital degrees. It is quite easily to mis-aim the dish slightly and get strong signal from the wrong satellite altogether. DVB-S and [[DVB-T]] (Digital Video Broadcast - Terrestrial) share in common many characteristics. They both share in common a remote transmitter broadcasting a signal through the air to an antenna, with bundles of channels (multiplexes) being transmitted by one or more transponders. In the case of terrestrial broadcasts, the need for precise aiming is less critical as the transmitters are largely omnidirectional and within short distances. In the case of satellite broadcasts, however, the antenna (dish) must be aimed at an object the size of a schoolbus at a distance of 35,000 kilometers. Precise aiming is, to say the least, critically important. DVB-S satellites are in geosynchronous equatorial orbit. This means that they are in fixed orbital locations over a single spot on the equator. In populated portions of the world, there is a broadcast satellite at approximately every three orbital degrees. It is quite easily to mis-align the dish slightly and get a good strong signal from the wrong satellite. Just as with terrestrial broadcasts, the quality and size of your antenna is directly proportional to the strength and type of signal being received. The two types of digital broadcast commonly in use today are C-Band and Ku-band. C-band is the older format of digital satellite broadcast, bringing to mind gigantic eyesore dishes. Ku-band is the format favored by consumer dish operators just as Freesat, DISH Network, and Bell ExpressVu. While it is possible to tune Ku and C-band signals with large dishes, only Ku-band signals can be tuned with the small round and elliptical "patio" dishes. MythTV supports *only* unencrypted material, or material that is decrypted through the use of a legitimate provider-supplied CAM (Conditional Access Module). This rules our for-pay services that do not provide CAMs. Attempts to tune DISH network, DirecTV, Bell ExpressVu and similar are unwelcome in the MythTV community as those providers to no supply CAMs. MythTV supports '''only''' unencrypted material, or material that is decrypted through the use of a legitimate provider-supplied CAM (Conditional Access Module). This rules out digital reception of paid-for services that do not provide CAMs (although it is still possible and legal to capture the analog outputs of these boxes). Attempts to tune DISH network, DirecTV, Bell ExpressVu, Viasat and similar with DVB-S cards are unwelcome in the MythTV community as those providers do not supply CAMs. [http://www.lyngsat.com Lyngsat] is an excellent reference for what satellites are in the sky, where they are located, and what channels they contain. ** The DVB-S card must support the modulation and FEC (Forward Error Correction) used by the satellites you wish to tune. If the card does not support these specifications, you will be unable to une your channels! If your provider supplies CAMs, you will need a DVB-S card with an *on-board* (non-USB) CI slot, and the card and CI must be supported by linux. ** The DVB-S card must support the modulation and FEC (Forward Error Correction) used by the satellites you wish to tune. If the card does not support these specifications, you will be unable to tune your channels! If your provider supplies CAMs, you will need a DVB-S card with an *on-board* (non-USB) CI slot, and the card and CI must be supported by linux. ** The required size of the dish will be determined by the signals you wish to tune. DVB-S tuner cards provide adequate voltage to power at least one LNB in most cases. Choose a location to mount the dish that is sheltered from the elements (particularly wind) and with as clear a view of possible of the satellites. In the northern hemisphere, this will be a generally southern view and in the southern hemisphere, a northern one. Remember, the satellites are in orbit over the equator. The most critical element of setting elevation is understanding that most consumer dishes are '''offset dishes'''. While you might set the elevation to 45 degrees, it will appear to you that the dish is only aimed at 23 or so degrees. The offset of the dish comes from the fact that the dish arm and LNBs are mounted offset from the center and thus the signal is bounced off from a higher angle and reflected down onto the LNBs. This means that some near-impossible aiming conditions are actually quite possible (see example right). A quick trick to see the actual angle aimed by the dish is to set it to the DishPointer approved value and to look from just behind the bottom of the dish over the LNB. This is where your dish is actually aimed. In the example, it appears the dish is aimed straight at a tree. However, because of the 22 degree offset of the dish, the top of the tree is cleared by several feet. The most critical element of setting elevation is understanding that most consumer dishes are '''offset dishes'''. While you might set the elevation to 45 degrees, it will appear to you that the dish is only aimed at 23 or so degrees. The offset of the dish comes from the fact that the dish arm and LNBs are mounted offset from the center and thus the signal is bounced off from a higher angle and reflected down onto the LNBs. This means that some near-impossible aiming conditions are actually quite possible (see example right). Azimuth is the compass direction the entire dish assembly must be pointed towards the satellite(s). The only thing to keep in mind is that because of variations in the shape of the Earth's magnetic field, one must adjust the aiming of the dish in one direction or another. The easiest way to accomplish this is to find a visual reference using DishPointer and to point the center of the LNB arm at that (as the site compensates for these variations for you). For single-LNB setups, adjusting skew ''is not necessary''. Skew adjustments are only for aiming multiple simultaneous orbital locations. Skew is the rotation of the dish like a car's wheel, either clockwise or counter-clockwise (when viewed from behind) to compensate for multiple orbital locations at differing elevations. Take the value reported by your provider or DishPointer and adjust the skew setting on your dish. Note that many consumer dishes actually reverse the skew values, so the proper setting is sometimes to take the Dishpointer value and subtract it from 180. Thus, a DishPointer Value of 69.5 degrees clockwise would translate to rotating a Dish Network dish to the 110.5 degree position clockwise. Once you have set Elevation, Azimuth, and Skew, you should be within a few degrees of the satellite. If aiming with a friend, you can tighten all the bolts until the dish can be adjusted in all directions with gentle but firm pressure, and use the signal meter on a receiver to make fine adjustments until maximum signal strength is reached. If, however, you are peaking the dish alone or have no receiver, a dish signal meter/finder is exceedingly helpful. This small, inexpensive device connects to the coax between the receiver and LNB and includes a signal strength meter. # Attach the "To Receiver" side of the meter to the line running to your DVB-S card or receiver. Attach the "To LNB" side of the meter to a short line to the LNB. # Turn the gain knob up to make sure that the device activates, peaks out, and beeps at some point in the range. Once you have found the minimum gain needed to peak the needle/signal meter, turn down the gain so that the needle floats in the center (on a meter marked 0-10, you would want the needle "floating" at 5). # Starting with Azimuth (compass direction), adjust in each direction to find whether the needle "peaks" again if the dish is adjusted to one side. Keep adjusting the gain knob down so that the needle "floats" again. Once you have found the point where the needle "falls off" when the dish is adjusted in any direction, and you cannot turn the gain down any more, tighten the Azimuth bolts so that the dish no longer turns from side to side. # Repeat the adjustment with the elevation settings. Tighten the Elevation Bolts. # If using more than one LNB/orbital location simultaneously, adjust skew as above. Tighten the Skew Bolts. # Remove the Signal Meter from the line (it uses approximately 6 dB to run, meaning the difference between usable signal and nothing at all). The "center" position on the gain knob is the likely threshold for usable signal. If the meter runs from -4 dB to 4 dB, then you must peak your dish enough for "0" or below to cause the needle to peak. This Howto presumes you have properly set up your DVB-S card in Linux, and have read the generic MythTV installation documents. At this point you should have functional channels on your system. 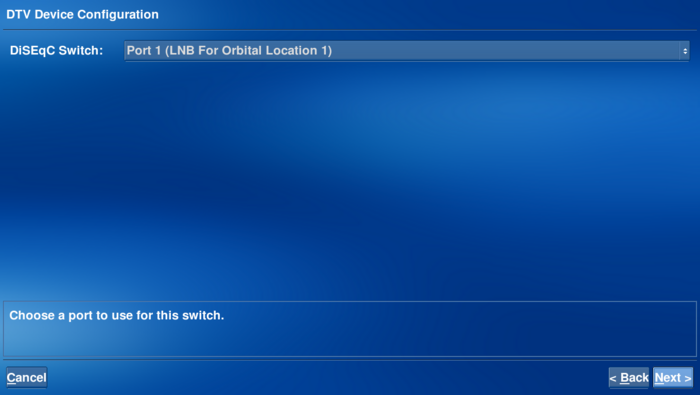 You can go back and add more LNBs to your DiSEqC switch and scan as you did above until you have all your channels. Enjoy! DVB stands for Digital Video Broadcast - Satellite. At its core, DVB-S is a simple mechanism. Digital transmitters beam sets of channels to an area, and they are received by antennas aimed at the transmitter. The scope of this article is to provide basic understanding of DVB-S technology, dish pointing and peaking, and setup in MythTV. In keeping with the philosophy of the (largely US based) MythTV development and user community, no discussion of prohibited activities (civil or criminal) is welcome at any time. If some activity utilizing DVB-S is legal in your locale, bear in mind that it is likely not so in the United States (under whose laws MythTV must exist) and is therefore still unwelcome in all official MythTV support channels. MythTV supports only unencrypted material, or material that is decrypted through the use of a legitimate provider-supplied CAM (Conditional Access Module). This rules out digital reception of paid-for services that do not provide CAMs (although it is still possible and legal to capture the analog outputs of these boxes). Attempts to tune DISH network, DirecTV, Bell ExpressVu, Viasat and similar with DVB-S cards are unwelcome in the MythTV community as those providers do not supply CAMs. Lyngsat is an excellent reference for what satellites are in the sky, where they are located, and what channels they contain. The DVB-S card must support the modulation and FEC (Forward Error Correction) used by the satellites you wish to tune. If the card does not support these specifications, you will be unable to tune your channels! If your provider supplies CAMs, you will need a DVB-S card with an *on-board* (non-USB) CI slot, and the card and CI must be supported by linux. The required size of the dish will be determined by the signals you wish to tune. An extremely helpful site is Dishpointer. This Google Maps mashup allows you to provide a set of coordinates or street adress, select the satellite or satellites you wish to aim, and will provide near-perfect aiming information. It is not uncommon for the aiming information to be within a single degree of peak accuracy for the location. Mount the dish securely using a tripod, wall mount, or other sturdy means of preventing wind and other interference. Leave the dish slightly loose in the mount for the aiming procedure. Run a short length of RG6 coaxial cable from each LNB (located at the end of the dish "arm") to a DiSEqC switch. If using only one LNB, you can run the coaxial cable straight to your receiver or DVB-S card. If you wish to run multiple receivers/DVB-S cards, you will need a DiSEqC switch with an number of outputs equal to the number of cards/receivers you wish to use, and inputs equal to the number of LNBs/Orbital Locations you wish to aim at. Some DVB-S setups use a single LNB and a DiSEqC-compatible motor to reaim the dish dynamically. This is sophisticated but purely optional. Although your provider might supply you with a general chart of aiming instructions, Dishpointer is immensely helpful in showing visual landmarks for aiming the dish. Provide the site with your location using address or Latitude/Longitude, and select the satellites you wish to aim from the drop-down. Satellite aiming consists of three "directions:" Elevation, Azimuth, and Skew. These represent the angle, direction, and rotation of your dish. The most critical element of setting elevation is understanding that most consumer dishes are offset dishes. While you might set the elevation to 45 degrees, it will appear to you that the dish is only aimed at 23 or so degrees. The offset of the dish comes from the fact that the dish arm and LNBs are mounted offset from the center and thus the signal is bounced off from a higher angle and reflected down onto the LNBs. This means that some near-impossible aiming conditions are actually quite possible (see example right). A quick trick to see the actual angle aimed by the dish is to set it to the DishPointer approved value and to look from just behind the bottom of the dish over the LNB. This is where your dish is actually aimed. In the example, it appears the dish is aimed straight at a tree. However, because of the 22 degree offset of the dish, the top of the tree is cleared by several feet. For single-LNB setups, adjusting skew is not necessary. Skew adjustments are only for aiming multiple simultaneous orbital locations. Skew is the rotation of the dish like a car's wheel, either clockwise or counter-clockwise (when viewed from behind) to compensate for multiple orbital locations at differing elevations. Take the value reported by your provider or DishPointer and adjust the skew setting on your dish. Note that many consumer dishes actually reverse the skew values, so the proper setting is sometimes to take the Dishpointer value and subtract it from 180. Thus, a DishPointer Value of 69.5 degrees clockwise would translate to rotating a Dish Network dish to the 110.5 degree position clockwise. 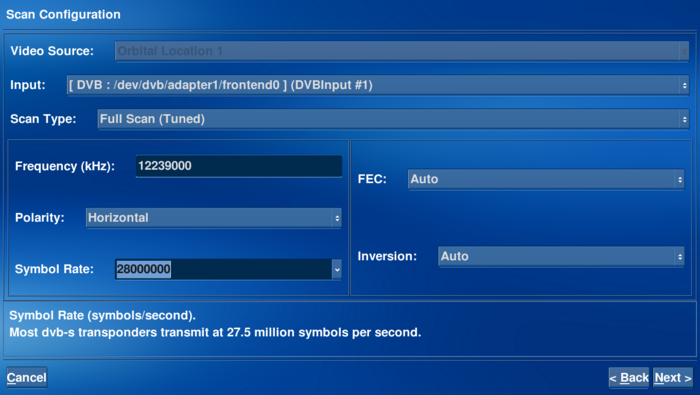 Attach the "To Receiver" side of the meter to the line running to your DVB-S card or receiver. Attach the "To LNB" side of the meter to a short line to the LNB. Turn the gain knob up to make sure that the device activates, peaks out, and beeps at some point in the range. Once you have found the minimum gain needed to peak the needle/signal meter, turn down the gain so that the needle floats in the center (on a meter marked 0-10, you would want the needle "floating" at 5). Starting with Azimuth (compass direction), adjust in each direction to find whether the needle "peaks" again if the dish is adjusted to one side. Keep adjusting the gain knob down so that the needle "floats" again. Once you have found the point where the needle "falls off" when the dish is adjusted in any direction, and you cannot turn the gain down any more, tighten the Azimuth bolts so that the dish no longer turns from side to side. Repeat the adjustment with the elevation settings. Tighten the Elevation Bolts. If using more than one LNB/orbital location simultaneously, adjust skew as above. Tighten the Skew Bolts. Remove the Signal Meter from the line (it uses approximately 6 dB to run, meaning the difference between usable signal and nothing at all). Set up your card as DVB type in mythtv-setup's "2. Capture Cards" section. On the capture card setup page, you will see a button called "DiSEqC." Highlight it and press enter. We will be building a graph of our DiSEqC hardware including switches, LNBs, etc. You start with a blank screen and the word "(Unconnected)." Highlight "(Unconnected)" and press enter. You will see a list of DVB-S hardware myth can manage. 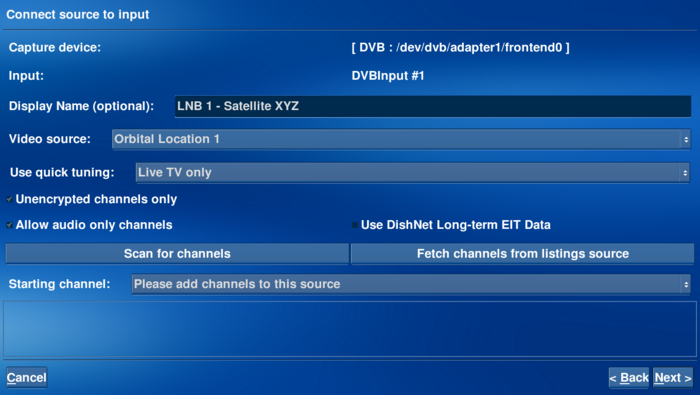 If your DVB-S card runs directly to an LNB, you can choose "LNB" and be done on this screen (and skip to step 3). 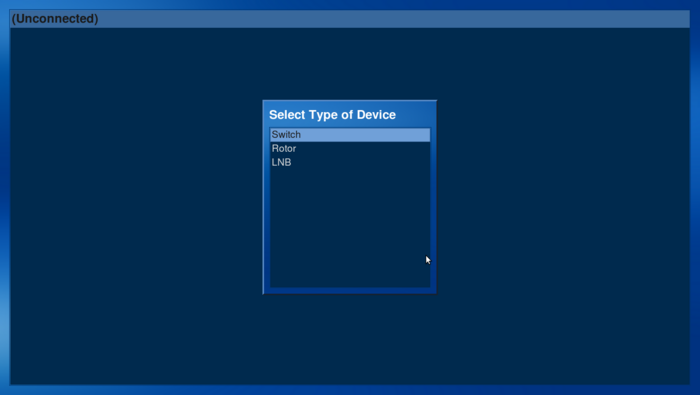 We will set up a DiSEqC switch and several LNBs. Select "Switch." 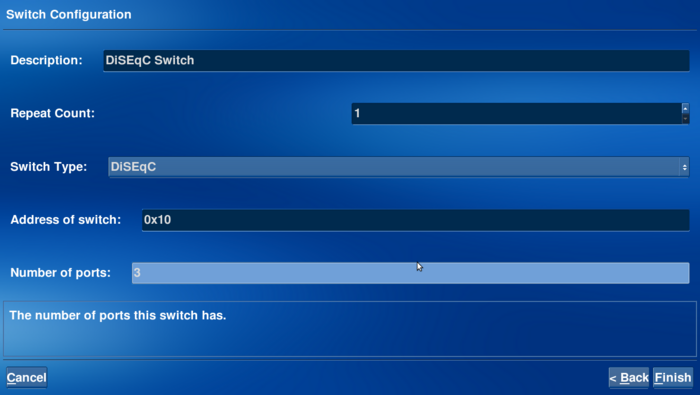 On the switch configuration screen, give your switch a name. In the example, the switch is called "DiSEqC Switch." Set the type to "DiSEqc" unless you are using another type of switch. For "Number of ports," choose the number of LNB ports your switch has. In this case, the switch is capable of connecting to 3 LNBs. Choose "Finish." Note: Some users have reported needing to set alternate numbers of ports for their DiSEqC switches in order to have LNBs scanned properly. If it appears the channel scanner is scanning the wrong LNB, try experimenting with different switch types and numbers of ports. You will now see your switch represented in the graph, and an "(Unconnected)" node for each port. We will set up an LNB on Port 1. Choose the first port in the list and press enter. Choose "LNB." Give the LNB a unique name (a good choice would be the name of the satellite it is aimed at). Choose the LNB Preset type for your locale and select "Finish." Escape out to the top Mythtv-setup menu. Enter the "3. Video Sources" menu. Set up a new listings source for each orbital location even if they are all from the same provider. This is actually very important; it seems that MythTV will sometimes act very strangely if you do not do this (channel tuning can occur on the incorrect LNB). So, this can not be over-emphasized. As for the EPG data, you can use EIT or any normal Myth grabber. Escape out to the top Mythtv-setup menu. 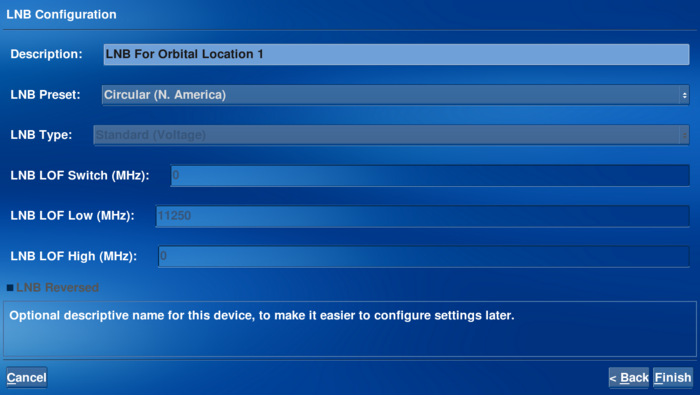 Enter the "4.Input connections" menu. Highlight your DVB card and press Enter. You will see a screen unique to DiSEqC setup. Select the DiSEqC switch port with the LNB we are setting up (in the example, port 1). Continue to the next page. Set the video source to the source you set up for this orbital location. When you are satisfied with the settings, highlight and select "Scan For Channels." MythTV will default to the "Tuned Scan." You will need the transponder frequencies, polarities, and symbol rates for each transponder you wish to scan. A good source is Lyngsat. Note: Lyngsat transponders and symbol rates are in Megahertz, and Myth expects them to be in KiloHertz. Multiple each value by 1000. A Transponder on Lyngsat listed as "11715 R" and "SR 20000" would be a frequency of 11715000, Right Circular Polarity, and Symbol Rate of 20000000. Leave FEC and Inversion on auto and press next. Myth will attempt to scan given the setup you have created. If the scan fails, check your dish pointing and/or settings and try again. When the transponder has finished scanning, you can press "Back," and attempt a "Full Scan of Existing Transports" scan type. With any luck, this full scan will pick up all the information for the other transponders on this satellite and you will end up with all available channels. Otherwise, you will have to manually input each transponder and scan it. This page was last modified on 16 September 2015, at 18:13.